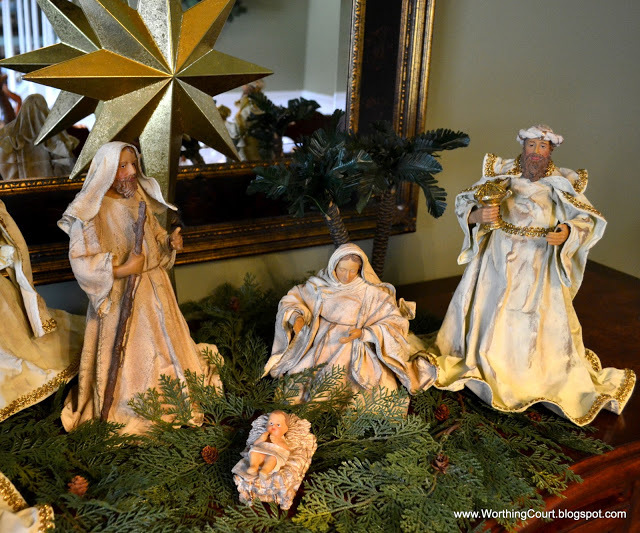 Wow, these Christmas linky parties are all over blogland! 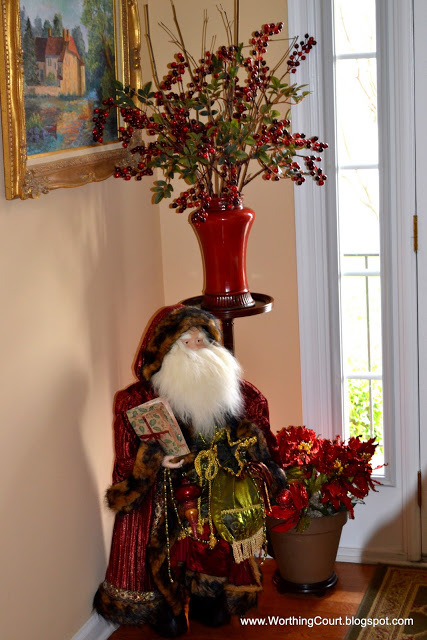 Tonight, I’m participating in the Holiday Vignettes Party over at French Country Cottage. 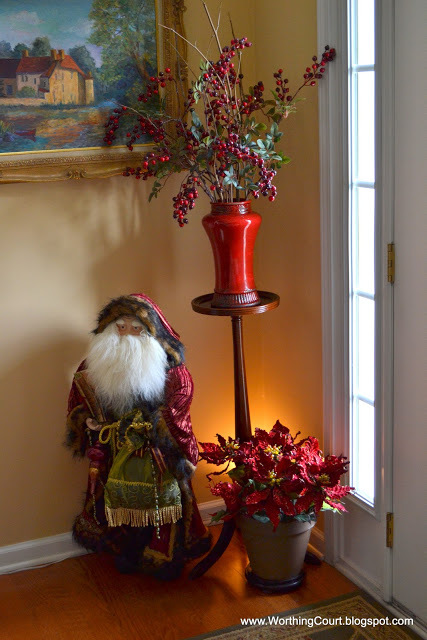 I started off by moving a couple of things around in the foyer so that I could create this vignette using my traditional Santa. I pulled one of the urns off of the sideboard in my dining room to use as a vase for greenery and faux berry sticks. 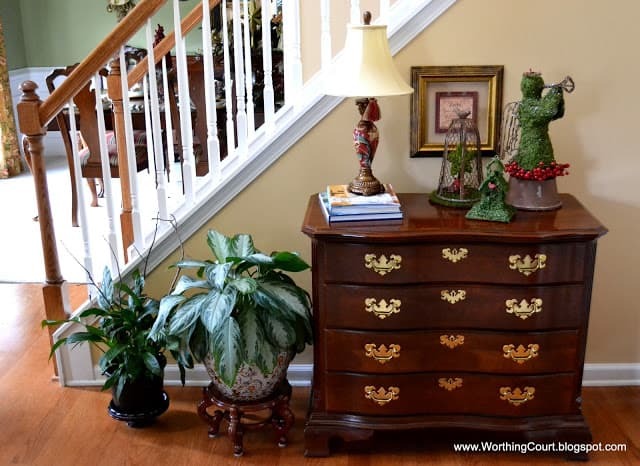 Placing it on a pedestal gives height and helps to balance the look of the vignette in this two story tall foyer. I placed a spotlight on the floor behind the vignette to help highlight this dark corner at night. 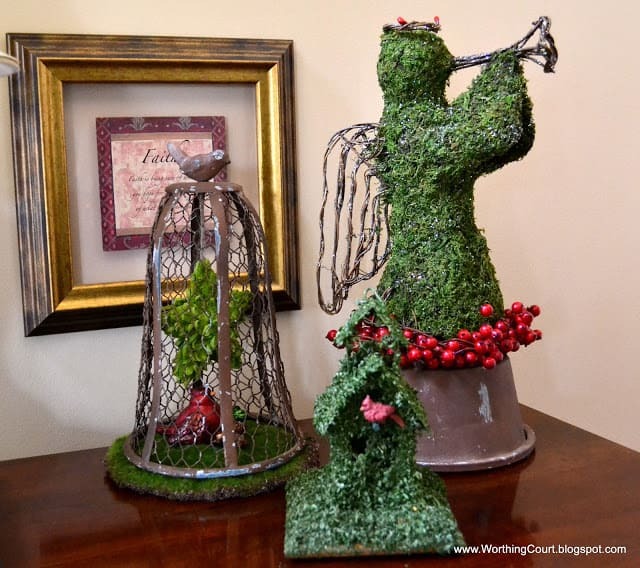 On the chest in the foyer, I used a moss covered angel that I’ve had for several years as inspiration to create a gardeny looking vignette. 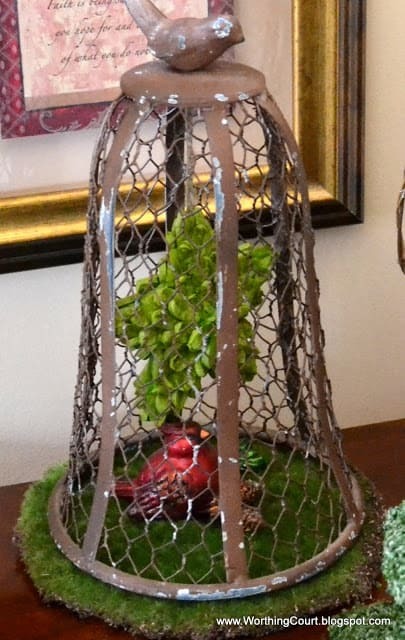 The base that the angel is sitting on is the base to my chippy wire bird cloche. The little bird house started out as white, but I spray painted it green, then added spray adhesive once it was dry and covered it with parsley. I tried the trick of spraying it with hairspray, but it still sheds like crazy. Anyone have any tips to prevent that from happening? The top part of the cloche is sitting on a moss pad that I found. I hot glued the string for a moss star shaped Christmas ornament on the top of the inside of the cloche and set a cardinal Christmas ornament on the inside. 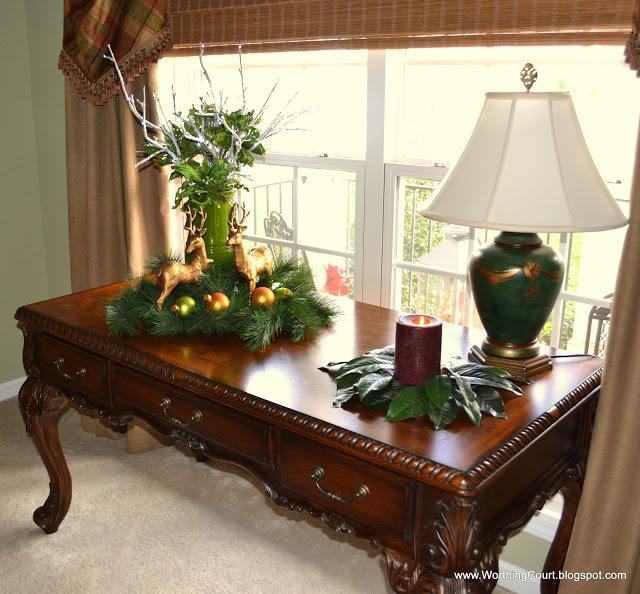 This little vignette with a sleigh and a couple of candles sits on the table in front of the loveseat in the living room. 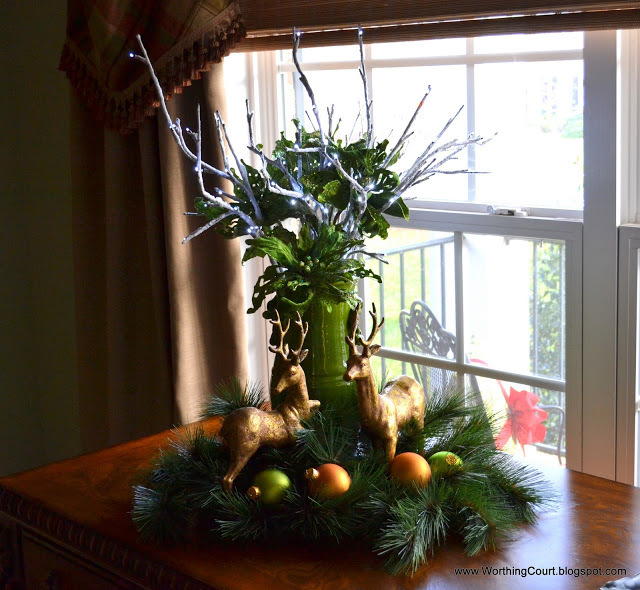 On the table in the living room, I created a vignette using an urn filled with apple green sparkly poinsettias and lighted sticks. I added a couple of faux pine boughs, deer and a few ornaments and called it done! I thought it looked awfully lonely on the table all by itself, so I added a candle surrounded with magnolia leaves (faux of course) off to one side. I’m not quite sure if I like it or not. 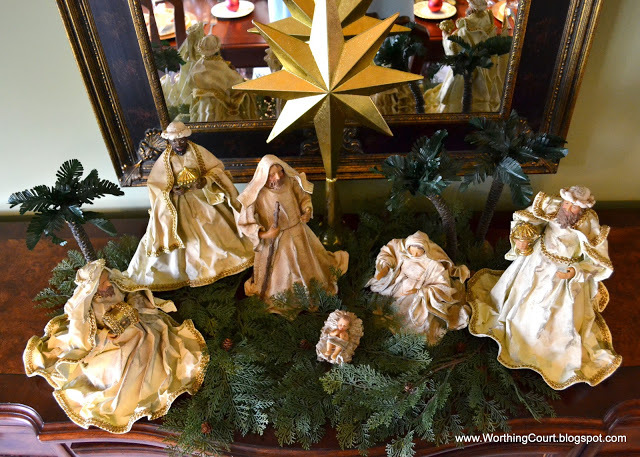 I showed you my nativity the other day in my post about Christmas in the Dining Room. Several of you asked for closeups, so I thought I’d include it with my other vignettes. I love the detail in the faces of the figurines. I think the clothing is made out of canvas that has been stiffened with something and then glazed. 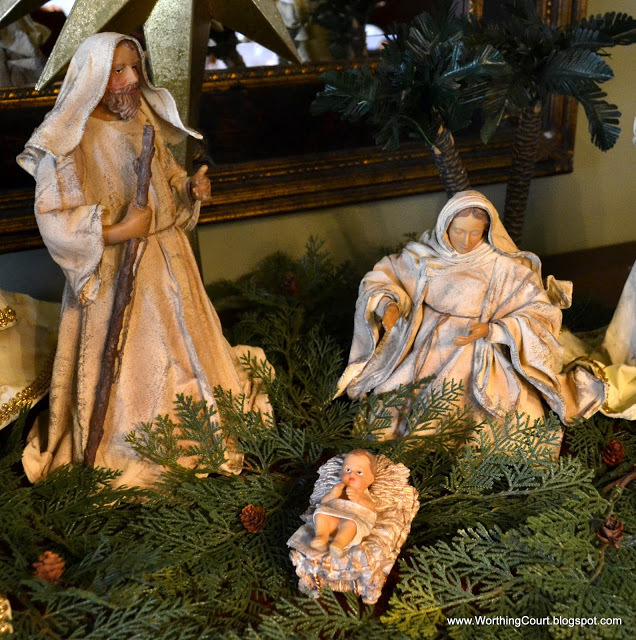 Here’s a closer look at Joseph and two of the wisemen. And a closer look at Mary and the other wiseman. There are other little vignettes around the house, but I really didn’t think they were worth including here. 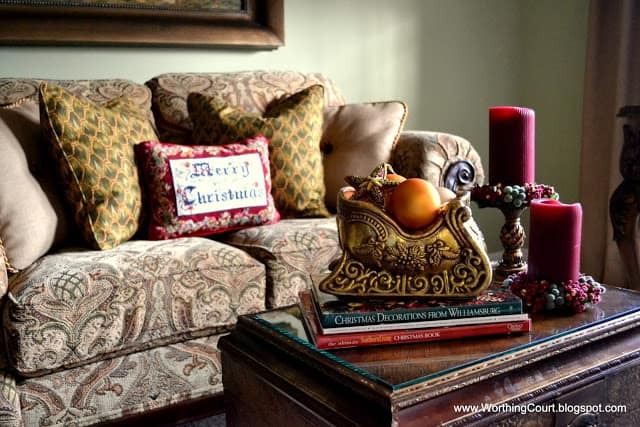 I hope all of your Christmas decorating and plans are coming together nicely! Your vignettes are lovely, but that Nativity is absolutely fabulous. I have several, but nothing as elegant as yours. This is really a gorgeous nativity set. Love all your vignettes. they are so very warm and rich looking. How did I miss this post? 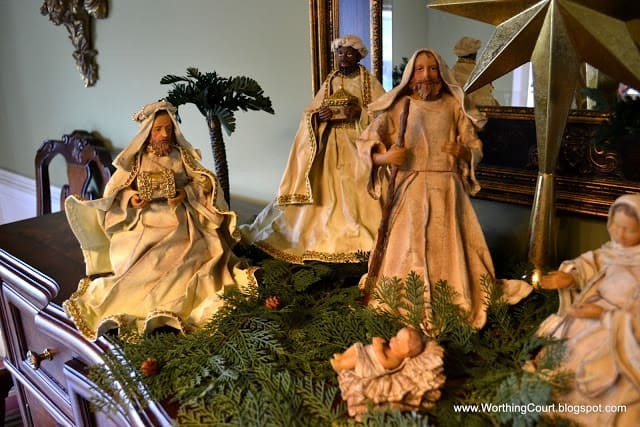 I love your nativity set… I’m looking for one just like it. Have a lovely evening, Suzy! you are the most talented and creative individual I have the priviledge of knowing…I just sit in amazement at all of your beautiful creations. Merry Christmas! So pretty Suzy. I just love your house – when can I move in? Seriously – I visit quite a bit and take mental notes every time. You’ve got skillz!